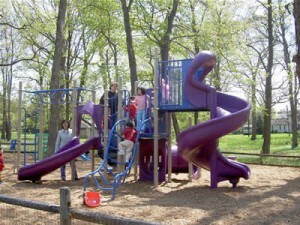 Open each day from dusk to dawn, Plains Park lies on an eight acre partially-wooded lot adjacent to Plains Mennonite Church parking lot and meetinghouse. The most visible part of the park is the pavilion with restrooms, kitchenette, and enough picnic tables to seat 100 plus people. 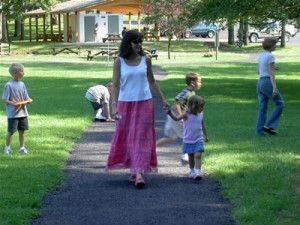 Beginning at the pavilion and winding through the park is a paved walking path. Following the walking path takes you past a playground area, bench swings in the middle of an oak grove, and the first tee of a disc golf course. The walking path continues across a large open playing field with soccer goals and softball diamond complete with backstop. The path then winds through a small but thickly wooded forest. The disc golf course follows the walking path through this forest where trees act as obstacles to overcome. Adjacent to both the parking lot and the woods is a full size basketball court for public use.